BRITISH FORMER FAR-right leader Tommy Robinson has been freed from prison after winning a legal challenge in a case that has galvanised his supporters worldwide. He was jailed for contempt of court and breaching a previous suspended sentence, having used social media to live-stream outside a Leeds Crown Court in northern England in breach of reporting restrictions around a trial. Since his imprisonment, supporters of US President Donald Trump including former White House chief strategist Steve Bannon have taken up his cause. Street protests have demanded the release of Robinson, who has previous convictions for assault, drug possession and fraud. A panel of three judges at the Court of Appeal in London quashed the finding of contempt, citing technical flaws, and freed him on conditional bail pending a new hearing. “The appellant is granted bail and the matter of contempt at Leeds Crown Court is remitted to be heard again,” said Lord Chief Justice Ian Burnett, the head of the English judiciary, reading the judgement. “We are satisfied that the decision at Leeds Crown Court to proceed to committal to prison so promptly… gave rise to unfairness. There was no clarity about what parts of the video were relied upon as amounting to contempt, what parts the appellant accepted through his counsel amounted to contempt and for what conduct he was sentenced. His case will be re-heard at England’s Old Bailey central criminal court in London “as soon as reasonably possible”, the judges said. The 35-year-old, whose real name is Stephen Yaxley-Lennon, was not in court for the hearing. Around 20 supporters, outnumbered two to one by police officers, chanted his name outside court while another 20 or so counter-protesters were also present. In the decision read out in court, the judges revealed the background to the case, much of which had previously been subject to reporting restrictions. 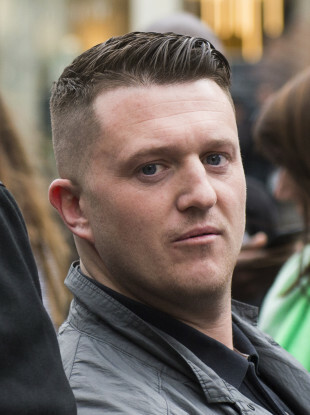 Burnett said Robinson had filmed inside a courtroom – an offence – in Canterbury, southeast England, in May 2017 during what he told the camera was a trial of “Muslim child rapists”. Robinson was given a suspended jail sentence and told he would face immediate imprisonment if he embarked on similar conduct within 18 months. In May 2018, he broadcast on Facebook outside Leeds Crown Court about a trial which was under reporting restrictions imposed to avoid prejudicing that case and other related ones. “During his live-streaming, the appellant had referred to the supposed religion of the defendants, the ethnicity of the alleged victims, the costs of the prosecutions, and (he) questioned why publication was prohibited,” Burnett said. Pursuing immediate proceedings against Robinson, the judge in the Leeds trial, Geoffrey Marson, “explained that he was conducting the second of three trials involving a total of 28 Asian men”, Burnett said. Marson told Robinson: “The vast majority of what you were saying… was reference to cases like this, to Asian men, to the grooming of 11-year-old girls and the number of cases like this. No date has been set for the new hearing at the Old Bailey. Email “Tommy Robinson supporters chant his name as he's freed from prison ”. Feedback on “Tommy Robinson supporters chant his name as he's freed from prison ”.